We’re at the tail end of quite an intense week, this last week. A week in which I’ve realised just how fast D is growing up but also just how proud (my Word of the Week) I am of her. She’s 13 tomorrow, a teenager, where on earth have the last few years gone? Regular readers of my blogs might remember that, up until exactly a year ago, D was having regular monthly injections. I’d write about how absolutely stressful she found this injections; how she’d get so so anxious in the build-up to them, how she’d absolutely howl with fear and pain as the needle went it and how I’d feel like my neck was going to snap as she squeezed all her anxieties out on me as the injection was administered. They weren’t times I look back on happily but it was necessary. Necessary as our girl entered precocious puberty (more “p” words) at the age of 8, way too early for her. Definitely too early as her emotional age was far younger than her actual age but bone density x-rays indicated that her body was three years older (i.e. 11). So we faced a quandary. There was no choice really for us, D was way too young in so many ways. We agreed to monthly Gonapeptyl injections. We were warned there may be side effects – an increased appetite and weight gain were just a couple – but, apart from the horrendous injection times and the anxieties that D suffered leading up to them, it was all worth it and the injections stopped last May (2016) as agreed at a meeting with her consultant in the children’s clinic (we’d had to see him every 6 months). Ever since then, I’ve been on alert, waiting for signs that her body has regulated itself, she’s got leaner and taller and I knew that we were on countdown for (yep, another “p” word) her first period since the injections ceased. And it’s happened. It’s all felt a little bit “wah, our daughter is growing up” but it’s also been a relief that everything is okay nature-wise after nearly 4 years of injections. It hasn’t been plain sailing for D, it scared her at first and then annoyed her. She’s not good with pain but absolutely detests calpol or ibuprofen so there’s been lots of cuddles, lots of snuggling on my knee even though she’s nearly as tall as me now. For a child who’s very much in the “here and now”, it hasn’t been easy for her to understand that periods mean that towels etc need changing and sometimes she might not be aware that they do (if you know what I mean). As a very visual child as well, it hasn’t been straight-forward for her to see what’s been going on and what could be, time-wise. She hasn’t particularly liked to handle towels either so that’s been me too, as I anticipated. 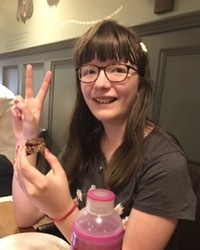 But, it’s been a massive relief that we had the option to put a block on puberty for 4 years, that she’s a bit older and we can talk about it, it’s all been a bit one-sided with me asking questions about how she’s feeling but that’s again as anticipated, that’s our D.
My experience of any sort of “chat” when I was nearly her age was being handed a bag with a “your aunt thinks you might need these soon” statement so the fact that I can ask D questions and try and gauge how she’s feeling is a positive, massively. Proud definitely sums up our week, proud of our girl and how we’ve got through it all …..until next time! Julie Clarke on 19th May 2017 at 7:40 am. Thank You so much for writing this. My daughter is only 8 but based on family history, this is something I may need to consider for her if she is an early p starter!! Jeannette on 19th May 2017 at 8:45 am. Devon Mama on 19th May 2017 at 8:41 am. Jeannette on 19th May 2017 at 8:46 am.